The four anti-hunting and anti-firearms bills listed in this alert passed the Legislature and went to Governor Brown’s desk for his action. He had until Sept. 30 to act on bills. 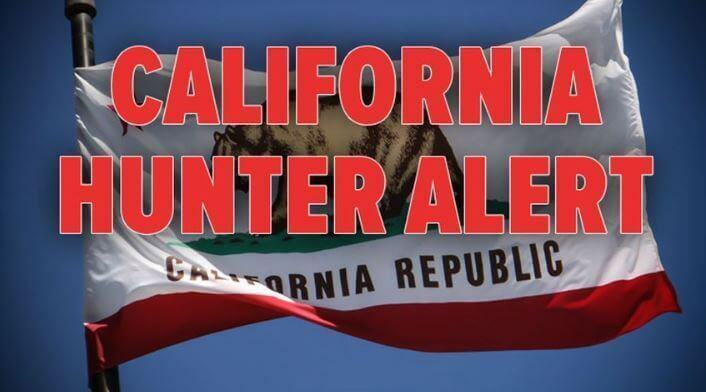 A fifth bill, AB 2805, was stopped the last week of session before it could go to the governor, thanks to your help. We were in the forefront of opposition to these anti-gun and anti-hunting bills, and we continued this fight to the governor and asked for his VETO on all four measures. The governor vetoed three of the four bills. Thank you for all of your efforts in contacting the governor and requesting his veto on these bad bills, and congratulations on the three victories! We appreciate all of your hard work that made this possible. SB 1487 (Stern, D-Canoga Park) Iconic African Species Protection Act. Governor Brown vetoed this bill on September 30 (Veto Message). AB 2805 (Bigelow, R-O’Neals) Wild pigs: validations. This bill was stopped at the end of August, the last week of session. SB 221 (Wiener, D-San Francisco) Agricultural District 1-A: firearm and ammunition sales at the Cow Palace. Governor Brown vetoed this bill on September 28, 2018 (Veto Message). A full summary report of your legislative bills will be sent separately and through your chapters as well. If you have any questions, please contact Don Giottonini (don@sacramentosafariclub.org) or Lisa McNamee (HDhuntclub@aol.com), your SCI CA Coalition legislative coordinators. We thank Lisa and Don for their tireless leadership on this legislative session’s bills of importance for SCI members. Safari Club International – First For Hunters is the leader in protecting the freedom to hunt and in promoting wildlife conservation worldwide. SCI’s approximately 200 Chapters represent all 50 of the United States as well as 106 other countries. SCI’s proactive leadership in a host of cooperative wildlife conservation, outdoor education and humanitarian programs, with the SCI Foundation and other conservation groups, research institutions and government agencies, empowers sportsmen to be contributing community members and participants in sound wildlife management and conservation. Visit the home page www.SafariClub.org, or call (520) 620-1220 for more information.